Summer screams salads and in my mind, there is nothing better than noodle-based salads, especially healthy ones! 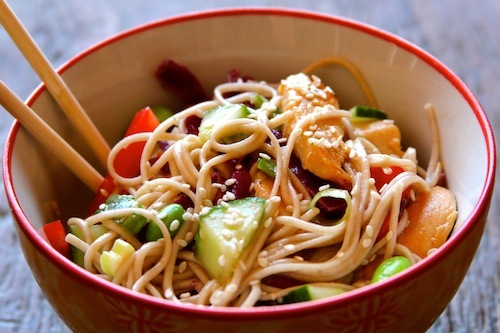 This recipe takes an Asian spin with buckwheat soba noodles and plenty of vibrant vegetables. Chicken has been added for protein but tofu could also work nicely. I must make a note of caution. This was my first time cooking with soba noodles and the first attempt at this recipe was a disaster. Let’s just say Soba noodles go from perfectly cooked to complete mush in a matter of seconds! Follow the package directions and perhaps even a little less for the boiling time. Rinse immediately with cold water to stop the cooking process. Soba noodles are thin Japanese noodles made with buckwheat flour and are commonly served cold. They can be found in the Asian section of many grocery stores or Asian markets. Edamame are a great addition to this salad and to make it as easy as possible, I simply used frozen ones and threw them in the boiling water 1 minute before the noodles were complete. A rotisserie chicken would be an easy addition as well rather than cooking your chicken. Healthy, beautiful and delicious! This salad is a guaranteed hit at your next summer function. Buckwheat soba noodles add protein. Buckwheat is also abundant in lipids, minerals (iron, phosphorus and copper), and vitaminsB1 and B2. Edamame are a good source of complete protein, high in fiber, a source of essential omega 3 fat, and they are rich in calcium, iron, zinc and B vitamins. Red cabbage has a high concentration of anthocyanin polyphenols, which play a therapeutic role in many diseases. Red cabbage is also packed with vitamin C and fiber, vitamin K, vitamin B6, potassium and manganese. It’s anti cancer super power is that it is one of the best natural source of glucosinolates. This recipe takes an Asian spin with buckwheat soba noodles and plenty of vibrant vegetables. Boil water and while water is boiling, prepare the vegetables. Prepare the dressing by adding the ingredients into a container that seals. Once all ingredients are added, shake vigorously. It will have a stronger vinegar taste but do not add more oil, it is perfect the way it is once all blended. Add noodles to the boiling water being very careful to time them according to package instructions. Toward the end of cooking time add the frozen shelled edamame. Remove the pot from the heat, drain and rinse under cold water, then drain again. 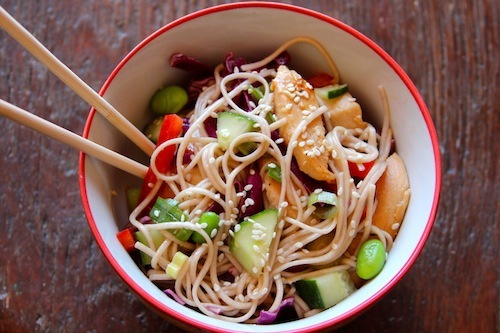 Add noodles, edamame, chicken and vegetables in a large bowl. Add dressing and toss well to coat, then sprinkle with sesame seeds.